Glyphosate Is Not Likely Carcinogenic. Both organizations DISCREDITED a study from International Agency for Research on Cancer ( IARC ). On March 20th, 2015, the IARC’s study arbitrarily classified the herbicide glyphosate, the active ingredient in Roundup, as « probably carcinogenic » on the basis of « limited evidence ». IARC’s use of the term « limited evidence » clearly implied that its study was SEVERELY FLAWED, DISTORTED, and UNBALANCED. The European Food Safety Authority ( EFSA ) functions as an advisor to policy-makers in the European Union ( EU ). The EFSA’s assessment on glyphosate is expected to lead the European Union to RENEW APPROVAL FOR GLYPHOSATE. The 2015 Glyphosate Expert Panel Of Scientists is DISPUTING a study from International Agency for Research on Cancer ( IARC ). Glyphosate is the world’s most widely-used weed control product and the main ingredient in Roundup herbicide. The 2015 Glyphosate Expert Panel Of Scientists presented its ASSESSMENT to the annual meeting of the Society for Risk Analysis on December 14th, 2015. The Panel will publish its ASSESSMENT at a later date after peer review. Weighted, Some Of The Data It Reviewed. Glyphosate As A Probable Human Carcinogen. Potential Mechanism For, Human Carcinogenesis. … Glyphosate Is Not Likely Carcinogenic. See later segment for more information about EFSA. The manufacturer of glyphosate, Monsanto, provided the INDUSTRY-FUNDED SUPPORT for the sixteen-member Glyphosate Panel Of Expert-Scientists, which was assembled by Intertek Scientific & Regulatory Consultancy. Ten of the sixteen scientists on the 2015 Glyphosate Expert Panel Of Scientists have been consultants for Monsanto in the past, and two others are former Monsanto employees, according to a roster published on Monsanto’s web-site. See later segment for more information about the MEMBERS of the 2015 Glyphosate Expert Panel Of Scientists. This is all GOOD NEWS ! 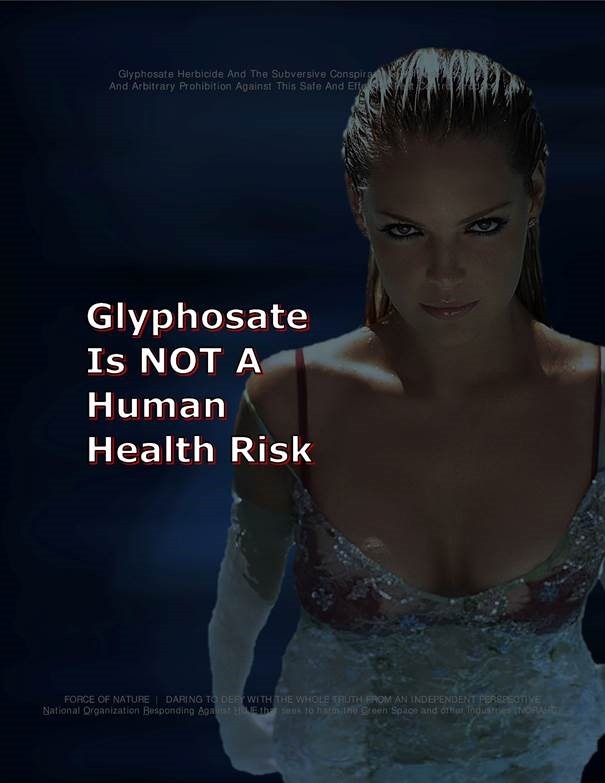 … Glyphosate Is NOT A Human Health Risk. Pesticide-Hating Fanatics say that the 2015 Glyphosate Expert Panel Of Scientists is somehow down-playing the risk to human health and trying to discredit the IARC study by casting doubt on some of the scientific studies that it reviewed. In 2015, an expert panel was convened to review the International Agency for Research on Cancer ( IARC ) monograph on glyphosate. Professor of Pathology, Department of Pathology. Director of Environmental Pathology and Toxicology. Head, Program on Medicine, Food and Chemical Safety, New York Medical College, Valhalla, New York, USA. Professor of Clinical Public Health, School of Health Sciences and Practice, New York Medical College, Valhalla, New York, USA. This expert has previously served as a consultant to Monsanto Company and, as part of that consulting relationship, published peer-reviewed data regarding glyphosate. Professor of Occupational Epidemiology, Institute of Occupational and Environmental Medicine, University of Birmingham, United Kingdom. Honorary Fellow, Faculty of Occupational Medicine. Former Chief Scientific Officer, Toxicology, Bioreliance Corporation. Former Principal Scientist, Central Product Safety, Procter & Gamble, USA. Professor, Department of Clinical Epidemiology, Arhaus University, Denmark. Former President, American College of Epidemiology. This expert was previously employed by Monsanto Company and, as part of that employment, published peer-reviewed data regarding glyphosate. Professor Emeritus, University of London, the Royal London Hospital, United Kingdom. Past Chairman, Advisory Committee on Pesticides, Ministry of Agriculture, Fisheries and Food. This expert has previously served as a consultant to Monsanto Company. Consultant in Genetic Toxicology and General Toxicology. Former Vice-President, Covance Labs Inc.
Assistant Professor, Emergency Medicine, Harvard Medical School. Staff Physician, Boston Children’s Hospital. Chief, Program in Medical Toxicology, Boston Children’s Hospital, USA. Medical Director, Maine & Rhode Island Poison Control Center, USA. Professor Emeritus, Toxicology and Environmental Hygiene, Technical University Munich, Germany. Professor Emeritus, Occupational Medicine and Epidemiology, University of Michigan School of Public Health, USA. Professor, Department of Pathology, Botucatu Medical School ( FMBo ), UNESP. Coordinator, Center for the Evaluation of the Impact of the Environment on Human Health, Brazil. Former Vice-President of Scientific and Regulatory Consulting, Covance Laboratories Europe. Member, UK Government Advisory Committee on Mutagenicity, United Kingdom. Professor of Epidemiology, University of Pittsburgh, USA. Professor of Clinical and Translational Science, University of Pittsburgh, Center for Clinical and Translational Science. Professor Emeritus, School of Environmental Sciences, and Director, Centre for Toxicology, University of Guelph, Canada. Adjunct full professor, University of Utah School of Medicine, USA. Former Chief, Office of Preventive Oncology, National Cancer Institute. Former Director, Cancer Prevention Fellowship Program. Senior Vice President, Food and Nutrition Group, Intertek Scientific & Regulatory Consultancy. Glyphosate Is UNLIKELY To Cause Cancer In Humans. The EFSA’s assessment on glyphosate could lead the 28-member European Union to RENEW APPROVAL FOR GLYPHOSATE. Glyphosate is a herbicide that was brought into use by Monsanto in the 1970s and is used in its top selling product Roundup as well as in many other herbicides around the world. BACKGROUND INFORMATION ― IARC has NOT proven that glyphosate causes cancer. And we repeat, IARC has NOT classified glyphosate as « carcinogenic to humans ». Glyphosate WILL NOT cause cancer ! According to U.S. Environmental Protection Agency ( US EPA ), German Federal Institute For Risk Assessment, Health Canada, and EVERY other science-based national regulatory agency in the world, the weight of evidence is AGAINST carcinogenicity. In other words, according to these agencies, glyphosate WILL NOT cause cancer. The IARC study of hazard does NOT indicate the risk of getting cancer. On the other hand, national regulatory agencies, like US EPA and Health Canada, DO evaluate risks. IARC merely looks at what is called hazard, and NOT risk. It DOES NOT take into consideration how much of, or how commonly, a risk glyphosate poses in the real world. IARC has failed to provide any new research concerning glyphosate. If the IARC hazard study against glyphosate is truly valid, then why doesn’t WHO itself demand more government regulation ?!?! Why should national regulatory agencies listen to IARC when it is ignored by WHO ?!?! 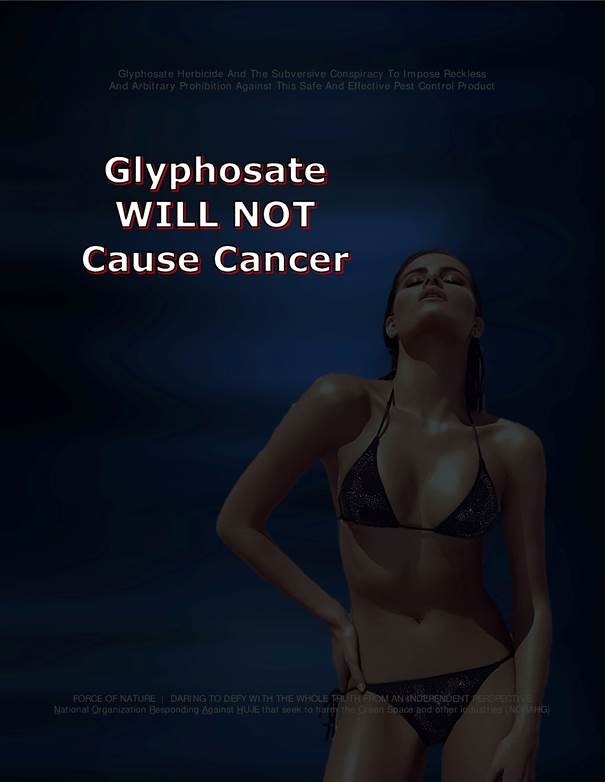 In fact, glyphosate WILL NOT cause harm and WILL NOT cause cancer ! According to an Anti-Pesticide & Environmental-Terrorist Organization, 1.4 million people had SIGNED A PETITION [ SO WHAT ?!?! ] calling on the European Union to SUSPEND [ i.e. PROHIBIT ] glyphosate approval pending further assessment. The EFSA said it carried out a thorough analysis and took account of the IARC’s findings. This has been an exhaustive process ― a full assessment that has taken into account a wealth of new studies and data. Regarding carcinogenicity, it is UNLIKELY that this substance [ glyphosate ] is carcinogenic. EFSA is proposing a limit on the maximum safe daily dose over a period of time, of 0.5 milligrams per kilogram ( kg ) of body weight. EFSA is also proposing a new acute limit, of the same level, for a single intake of glyphosate over a short period, for instance in one meal. The scientists say an 80-kg person could eat food containing a residue of 40 milligrams of glyphosate per day for the rest of their life. Monsanto said that was the equivalent of eating 400 kg of fruit or vegetables every day. EFSA scientists, who worked with experts from nations in the European Union ( EU ), said their study DIFFERED from the IARC’s in that it considered only glyphosate, whereas the IARC had ASSESSED GROUPS OF RELATED CHEMICALS. Sweden, one of the 28 nations in the European Union ( EU ), VOICED RESERVATIONS about IARC’s study. Limited Evidence Of Cancer In Humans Were Fulfilled. In 2016, the European Union ( EU ) must decide whether to RENEW EXISTING APPROVAL for glyphosate use. BACKGROUND INFORMATION ― Anti-Pesticide & Environmental-Terrorist Organizations like Greenpeace … what are they for ?!?! They serve NO useful or beneficial purpose to society, wasting tax-exempt money in order to operate as mere government opponents. Greenpeace does NOT deserve ANY charity tax-exempt statuses. They exist for one reason and one only … and that is to make enviro-profit. So far, Greenpeace has LOST ITS CHARITY STATUS in several jurisdictions, including Canada, and has been told to STAY OUT OF COUNTRIES, like India. Even government officials in Quebec have demanded that Greenpeace STAY OUT OF THE PROVINCE, accusing its fanatical-activists of being « a bunch of job killers ». Greenpeace’s TAX-EXPEMPT STATUS MUST BE INVESTIGATED, and ITS CHARITY STATUS MUST BE REVOKED WORLD-WIDE. Dr David Garabrant, a member of the 2015 Glyphosate Expert Panel Of Scientists that reviewed a potential link between glyphosate and cancer says it doesn’t matter who pays for scientific research. Dr David Garabrant, a University of Michigan Epidemiologist, said INDUSTRY-FUNDED SCIENCE versus PUBLICLY-FUNDED receives too much attention. Instead, the public should EVALUATE THE MERITS OF THE SCIENCE. We should FOCUS ON THE QUALITY OF THE ANALYSIS AND THE QUALITY OF THE COMMENTS, not the affiliation of the author. The concern, always present in a case control study, is whether you can re-construct that past information accurately. People with cancer wonder why they got it … what did I eat … what chemicals were I exposed to ? There’s always concern … about reporting bias. We’re supposed to critique each other’s work … an active and heated discourse, that’s part of science. Dr Garabrant was part of the Panel’s sub-group that evaluated studies on glyphosate exposure, non-Hodgkin’s lymphoma, and multiple myeloma. Dr Garabrant said both IARC and the 2015 Glyphosate Expert Panel Of Scientists reviewed similar scientific papers, but the Panel experts gave LESS WEIGHT TO STUDIES WHERE SUBJECTS ARE INTERVIEWED FOLLOWING A CANCER DIAGNOSIS. Dr Garabrant and the Panel relied on a 2005 paper by Dr Anneclaire De Roos of the University of Washington. Dr De Roos studied more than 50,000 pesticide applicators in Iowa and North Carolina who documented their exposure to glyphosate prior to any sort of diagnosis. With An Incidence Of Cancer. We felt that study [ by Dr De Roos ] was FAR MORE RELIABLE than the other studies. We think the limitations of the other studies made them NOT GOOD INDICATORS of … the relative risk. The Panel members, including University of Guelph Toxicologist Dr Keith Solomon, said IARC relied too heavily on questionable studies. IARC’s equivalent working groups’ reviews suffered from significant weaknesses such as selectivity in the choice of data reviewed, failure to use all relevant biologic information … and failure to use weight-of-evidence ( WOE ) evaluations. IARC’S Anti-Glyphosate Hazard Study Against Glyphosate Is Severely Flawed, Distorted, Biased, & Unbalanced Pesticide-Hating Fanaticism ! Glyphosate ( Roundup ) WILL NOT cause cancer. International Agency for Research on Cancer ( IARC ), a mere subsidiary of WHO, has NOT officially classified glyphosate as « carcinogenic to humans ». However, on March 20th, 2015, the IARC’s study arbitrarily classified the herbicide glyphosate, the active ingredient in Roundup, as « probably carcinogenic » on the basis of « limited evidence ». Nonetheless, the IARC’s study has NOT classified glyphosate as « carcinogenic to humans ». In other words, according to IARC, glyphosate is NOT « carcinogenic to humans ». Additionally, national government regulators world-wide have concluded that glyphosate is NOT a human health risk, and yet only IARC has arbitrarily claimed that it is « probably carcinogenic ». Indeed, IARC is NOT even a regulatory authority. It is a mere subsidiary of the World Health Organization ( WHO ), which has NEVER issued a statement concerning glyphosate and cancer. If the IARC’s anti-glyphosate study was truly valid, then why didn’t WHO itself demand more government regulation ?!?! Why should national regulatory agencies listen to IARC when it is ignored by WHO ?!?! Unfortunately, anti-pesticide fanatics are implying that IARC’s « limited evidence » has somehow been withheld from U.S. Environmental Protection Agency ( US EPA ), German Federal Institute For Risk Assessment, Health Canada, and EVERY other science-based national regulatory agency in the world. In fact, there is NO regulatory agency in the world that regards glyphosate as a human health risk. In other words, according to these agencies, glyphosate WILL NOT cause cancer. Sadly, the IARC’s anti-glyphosate study was SEVERELY FLAWED, DISTORTED, BIASED, and UNBALANCED. The selection of « limited evidence » was severely unbalanced since IARC simply cherry-picked the most atypically negative reports in order to validate its pesticide-hating agenda. IARC also conveniently disregarded dozens of scientific studies that support the conclusion glyphosate is NOT a human health risk ! In view of these facts, THE PESTICIDE-HATING IARC HAS BEEN DISCREDITED ! The IARC’s anti-glyphosate study did NOT assess the risk of getting cancer. In fact, IARC did NOT evaluate actual human risks, but merely looked at what is called a hazard. On the other hand, national regulatory agencies, like US EPA and Health Canada, DO evaluate risks. IARC merely looked at what is called hazard, and NOT risk. It DOES NOT take into consideration how much of, or how commonly, a risk glyphosate poses in the real world. Additionally, IARC has also failed to provide any new research concerning glyphosate. Can glyphosate be considered carcinogenic based on the IARC’s study ?!?! Why do science-based national regulatory agencies around the world conclude that glyphosate is NOT a human health risk while only IARC arbitrarily claims it « probably » causes cancer ?!?! Because IARC is NOT a government regulatory agency, and it DOES NOT evaluate risk. Moreover, IARC most certainly is NOT a science, NOT a research, and NOT a health organization. It is clear that IARC has an agenda-driven bias for reasons of mere pesticide-hating fanaticism and politicized science. Obviously, IARC CANNOT BE TRUSTED ! Exhaustive laboratory, animal, and human research has not supported evidence that pest control products like glyphosate are NOT a human health risk and will NOT cause cancer when used properly. All of these products have been evaluated for their carcinogenic potential. Even Canadian Cancer Society’s own web-sites state, repeatedly, that scientific research does NOT provide a conclusive link between pest control products and cancer. If you question that glyphosate is carcinogenic based on the IARC’s study, perhaps you should consider advocating bans against similarly classified products & activities, like bacon, baked food, burgers, cooked meat, fish, fried food, grapefruit juice, night shift work, paint remover, roasted food, sausages, and vegetables. IARC has also evaluated chemical agents & activities that have HIGHER carcinogenic hazard than glyphosate, like alcoholic beverages, baby oil, oral contraceptives, outdoor air pollution, painter, plutonium, and sunlight. In essence, glyphosate is NOT a human health risk, and it is SAFE when used properly. 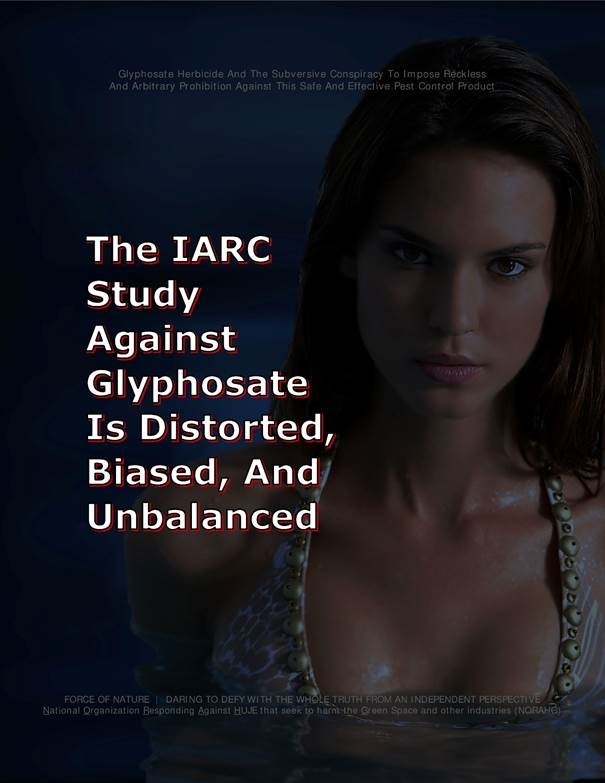 The IARC’s anti-glyphosate study is SEVERELY FLAWED, DISTORTED, BIASED, & UNBALANCED. IARC IS NOT TO BE TRUSTED ! To fight the war against Anti-Pesticide Terrorism, you need facts ! Discover What Anti-Pesticide & Enviro-Lunatic Terrorists Are Doing And Saying About Subversively Imposing Their Life-Style Choices Against Our Society. Read … Reports, Blogs, & Videos, From Force Of Nature, NORAHG, Pesticide Truths, & Uncle Adolph ― The Whole Truth From An Independent Perspective. Communities and businesses are being HARMED and DESTROYED and RAPED by LUNATIC-TERRORISTS who ARBITRARILY AND RECKLESSLY IMPOSE PROHIBITIONS against pest control products used in the Urban Landscape and by the Agriculture Industry, and who PERPETRATE OTHER ACTS OF ENVIRONMENTAL TERRORISM. We are living in the 9|11 Era of Anti Pesticide & Environmental Terrorism where at least ONE SUBVERSIVE ACT OF TERRORISM is perpetrated EVERY SINGLE DAY by LUNATIC-TERRORISTS. A LUNATIC is a person whose actions and manner are marked by extreme recklessness. The RECKLESS ACTS OF SUBVERSION by these LUNATIC-TERRORISTS has led to the ARBITRARY IMPOSITION of Anti-Pesticide PROHIBITION in several jurisdictions throughout North America. Because of LUNATIC-TERRORISTS, provinces like Ontario now have a TRAIL OF ECONOMIC DESTRUCTION WITH HUNDREDS OF SMALL BUSINESSES DESTROYED and THOUSANDS OF PEOPLE OUT OF WORK, a MORE DANGEROUS OUTDOOR ENVIRONMENT, and a BLACK MARKET IN PESTICIDES. Because of LUNATIC-TERRORISTS, we are living in the DARK AGE OF ANTI PESTICIDE TERRORISM where sound science is trumped by FAKE SCIENTISTS, JUNK SCIENCE and UNVERIFIABLE SECRET EVIDENCE through FABRICATION, INNUENDO, and INTERNET RUMOR ― scientific research PROVES that pest control products will CAUSE NO HARM and can be USED SAFELY. An informed public is better able to protect itself and its communities and businesses from LUNATIC-TERRORISTS who are THE LEAST QUALIFIED TO PROVIDE ANY ADVICE about pest control products or the environment. 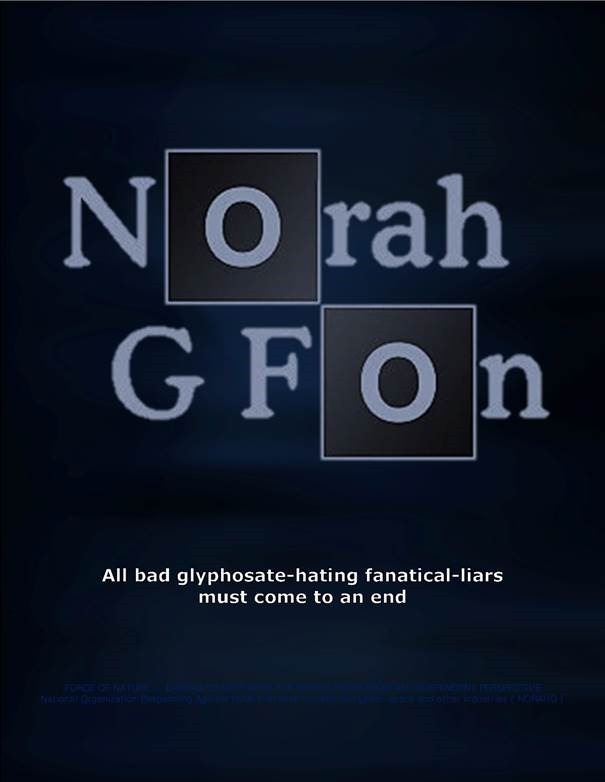 NORAHG morally represents the VAST SILENT MAJORITY of people associated with turf and ornamental plant maintenance who are OPPOSED to LUNATIC-TERRORISTS and their Anti Pesticide PROHIBITIONS, resulting in the CLOSURE or ABANDONMENT of green spaces under the RIDICULOUS PRETEXT CONCOCTED BY LUNATICS of somehow « saving » the environment. NORAHG is dedicated to reporting PESTICIDE FREE FAILURES, as well as the work of RESPECTED & HIGHLY RATED EXPERTS who promote ENVIRONMENTAL REALISM and PESTICIDE TRUTHS. NORAHG strikes back against the MYTHS concerning the need for prohibition against pest control products. NORAHG RESPONDS on behalf of the VAST SILENT MAJORITY of THE PUBLIC THAT DOES NOT WANT PESTICIDE BANS, and SUPPORTS those who work in the Professional Lawn Care Industry, the Golf Industry, and the Agriculture Industry. NORAHG is opposed to PESTICIDE FREE jurisdictions where LUNATIC-TERRORISTS have DOOMED CHILDREN to SUFFER INJURIES since Anti-Pesticide PROHIBITION inevitably leads to public and residential green spaces that become DANGEROUS AND PEST-INFESTED GARBAGE DUMPS. Primus inter pares, first among equals, describes Pesticide Truths, Uncle Adolph, and Force Of Nature ― they are formally equal to each other and are all accorded equal respect. The reports and blogs from Pesticide Truths, Uncle Adolph, and Force Of Nature, in some ways, are like Google for everything concerning the SUBVERSIVE ACTIVITIES of Anti-Pesticide and Enviro-Lunatic Terrorists. Many of these reports and blogs provide a sequence of historical events WITH COMMENTARY, the neutrality of which might be disputed. This is what we do. Don’t thank us. It’s a public service. And we are glad to do it.